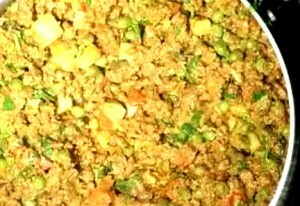 Kheema Hari Mirch Ka Do Piaza recipe by Nazia Nazar at DesiRecipes.com. Kheema Do Piaza is a traditional dish made with extra onions, seasoned with fresh herbs and spices. Mix the yogurt, salt , turmeric powder and cummin seeds into the minced meat. Heat the oil and fry the sliced onions till they are golden brown. Add the minced meat and stir fry till the meat loses all pinkness. Fry for another minute, then add the water. Cover the pot and let it cook, stirring occasionally. When the meat is half cooked add the green chillies, onion pieces and garlic . Stir and when the water dries and the mince is tender afterwards add the lemon juice and coriander leaves .